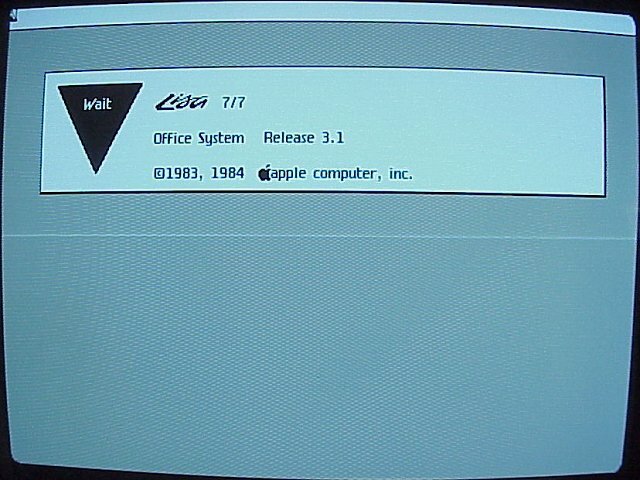 These are pictures of the Lisa Office System Version 3.1. Many, many thanks to j.musheneaux for the screen photos and screen dumps! 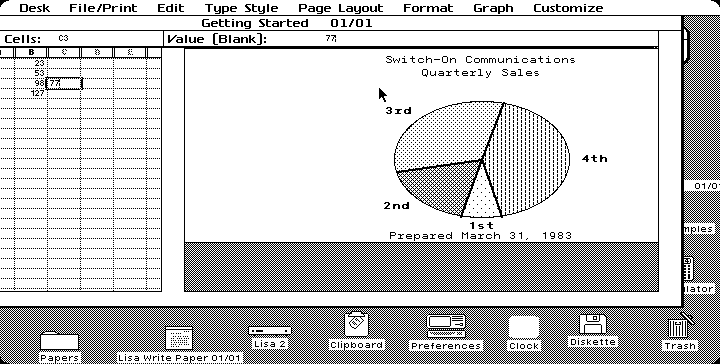 The Apple Lisa Office System was released in 1983 by Apple Computers with their Lisa microcomputer. 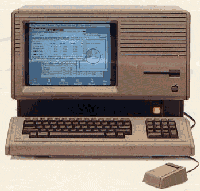 The Lisa hardware, operating system, and its set of office applications were designed by Apple to to work together to create a powerful document processing workstation. At the time, the Lisa's main competitors were big computers like the Perq and Xerox Star as well as various smaller non-graphical office systems. Microsoft's "Windows" would not see the light of day for several more years. Unfortunately the Lisa fell victim to Apple's own Macintosh - which was similar to the Lisa, but vastly scaled down and much less expensive. Added support for "micro disks" (standard 3.5" disks) which replaced the twiggy disks of the Lisa 1. 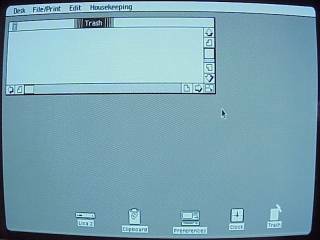 The "wastebasket" was renamed to "trash"
"Desk" menu added to the menu bar to make switching between document windows easier. 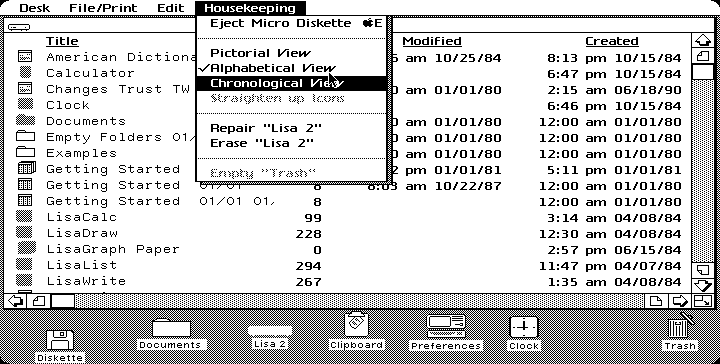 "View and disk" menu of the desktop manager changed to "Housekeeping"
The Lisa desktop - or Desktop Manager as it is called, is similar to the Macintosh Finder or Windows 95 Windows Explorer. It uses icons to represent system objects, and icons may appear on the desktop or in folder windows. This picture shows the main system icons (Icons that do not represent open documents). Clipboard: contains the most recent piece of information cut or copied from a document. Opening it will display the clipboard contents in a window. 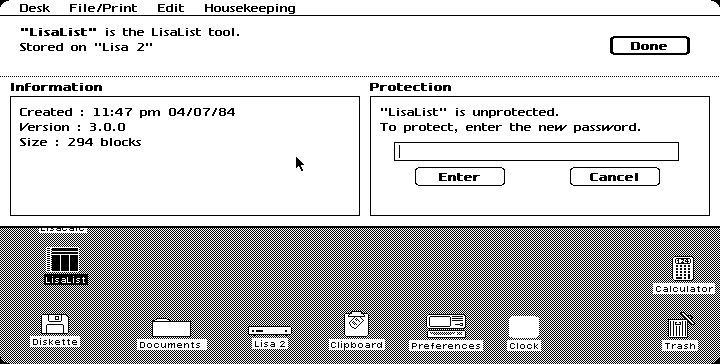 Preferences: Opens a window with a list of options that affect the operation of the Lisa. Clock: Opens a small window that displays the current time and date. Trash: Holds the most recently deleted item or group of items. Disk icons: Any attached or inserted disk will appear on the desktop. Different icons are shown for Twiggy disks, Micro (3.5") disks, Profile external hard drives, and internal Widget hard drives. Mr. J.Musheneaux sent me some cool Lisa screen dumps. A screen dump is a bit-for bit representation of what is in the computers' display memory as opposed to a photo of the display screen. 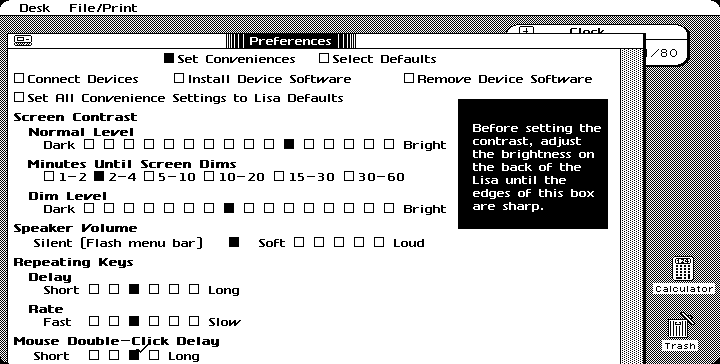 The Lisa did not use a 1:1 perspective ratio like most computer displays today, so the screen dumps look slightly stretched out (for example, the graph above should be a circle). For those who are interested, here is how I got these. It was kind of tricky. 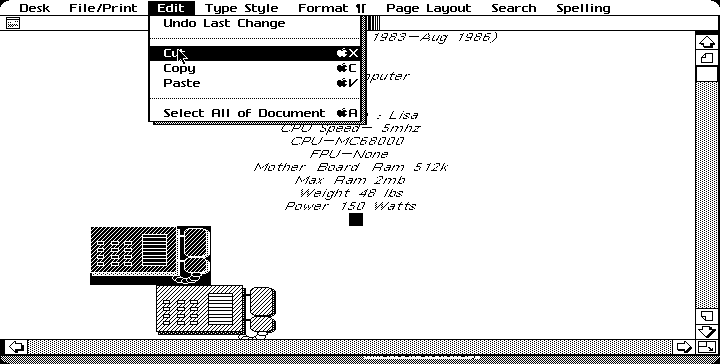 On Mr. Musheneaux's Lisa he would take a blank Lisa Office System formatted disk and press SHIFT-OPTION-7 to dump the current screen to a file. Up to 11 screen dumps can fit on one disk. 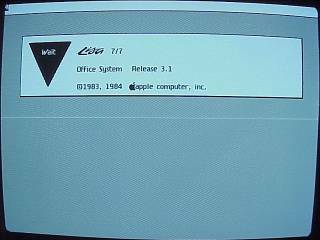 He would then use a program called DART on his Macintosh to read in the disk image and e-mail it to me. Then came the tricky part. I would convert the compressed DART images to uncompressed Diskcopy images using my Mac emulator. Not having a utility that could read the Lisa file system I had to extract the files manually. At first I converted the entire Diskcopy image to one large graphic image and cut-and-pasted the bits of the pictures out in to separate files, but since the bits were usually at the same place I made a batch file to automatically extract the images. The screen dumps themselves were just raw uncompressed 1-bit 720*364 images, but it was tricky converting them to a format that anything would recognize. Fortunately my old copy of Paint Shop Pro supports a format called "Sun Raster image" (.RAS) that uses the same monochrome format. All I had to do was attach the 32-byte header from a blank 720*364*1 .RAS file to the beginning of the raw file and PSP would recognize them. Another photo for comparison. Note the "empty folders" icon used for creating new folders. 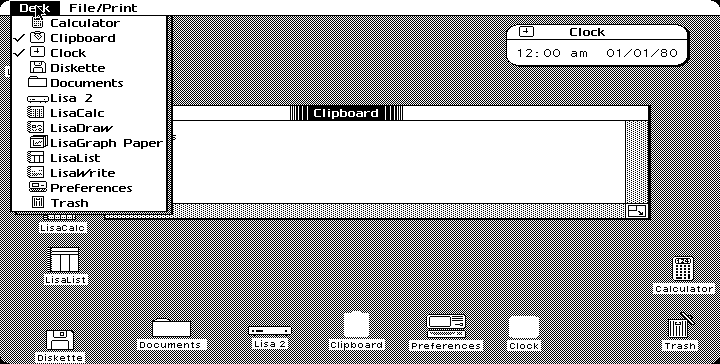 A similar method of creating new folders was also used in early MacOS. One of the more interesting things about the LisaOS is that it tries to extend the office metaphor further than most GUIs. For example: Documents are created by "tearing" a piece of "paper" off of a "stationary pad". That is, double-clicking the stationary icon creates a new document icon. There are also no "applications", only "tools" that must be present for you to work with the documents. This kind of user interface eliminates the need to start applications directly and the need to "save as". 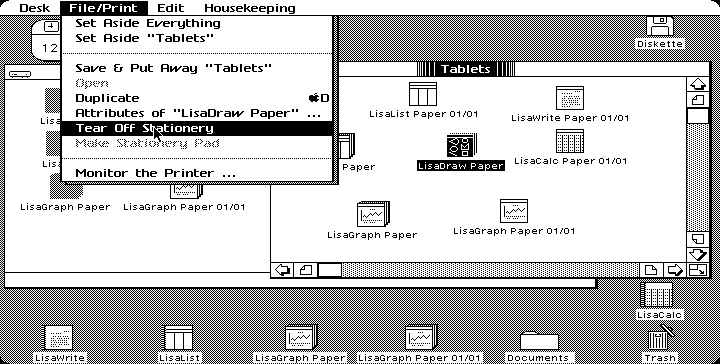 The stationary metaphor is extended to all applications on the Lisa, even LisaTerminal. The "LisaTerminal Paper" in this case represents a connection configuration file. Interestingly the Win9x HyperTerminal kind of does this but you must start the program directly to create a new connection. Set Aside - Minimize the window to an icon on the desktop. Put Away - Close the window and, if necessary, save any changes. Duplicate - Copy a file. Housekeeping - Disk management options. Pictorial view - icon view. This screen shows typical information about a file. Files are sized in "blocks" instead of exact bytes. Using "blocks" is not that uncommon in older OSes, but in my experience this can become confusing to the user especially if dealing with media or different systems with different sized "blocks". I found it interesting that the tools have version numbers. MS didn't start putting version information in their files until Windows 3.1. Documents can be password protected. I don't think this provides any technical form of protection. (Not that it would matter, these days they would just throw you in jail for circumventing "digital protection"). This shows an "Alphabetical view" of the contents of the hard drive. Other details are also shown. Icons for programs that are open or placed on the desktop are grayed out. This is the preferences window. The Lisa software can control the contrast of the video display, and can dim the screen after a specified amount of time. One funny thing about this window is that the check boxes at top behave like tabs on a tabbed dialog box. The look isn't quite there, but the feel seems to be. Tab boxes didn't become a regular fixture in MS-Windows until Windows 95. 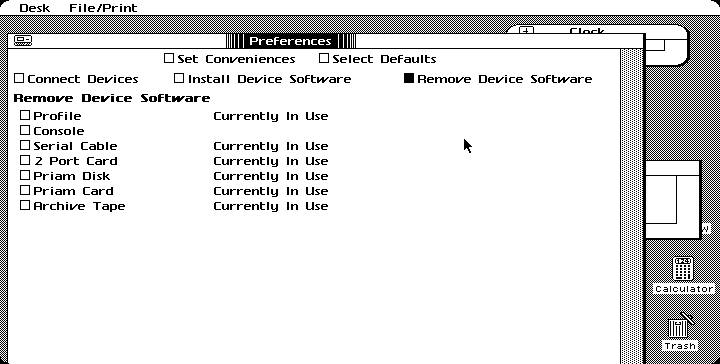 A couple of the other "tabs" in the preferences behave as a kind of device manager. Again, remember this was around 1983 - most other systems of the time weren't as easy to configure. Not that the Lisa had very much third-party hardware to worry about. 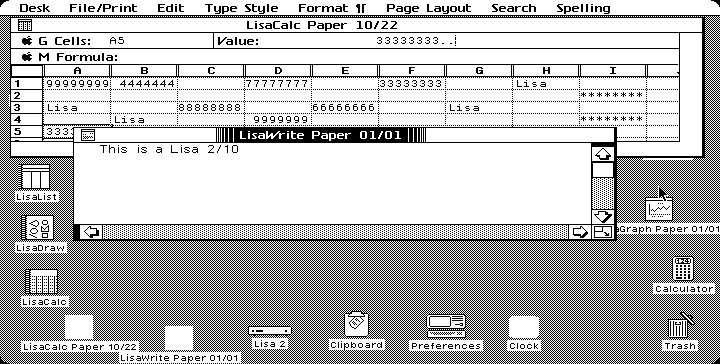 The Lisa allows document windows of different types to overlap. Information can be copied and pasted between documents. This is in contrast to the Macintosh which, up until System 7, would not share the desktop between running applications. If you wanted to copy some text out of MacWrite, and paste it in to MacDraw, you would have to copy the text, exit MacWrite, start MacDraw and then paste the text. The Desk menu (not in the first version of the LisaOS) enables easy switching between documents and other windows. 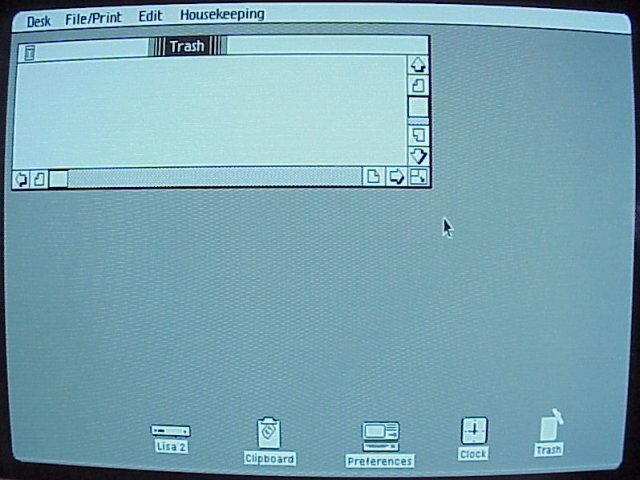 This is similar to the MacOS Application Menu added much later in Macintosh System 7. The Lisa Office applications have the ability to exchange different kinds of data between them. Graphics can be pasted in to text documents, and text can be pasted in to cells or graphics. The Lisa Office tools have an unusual copy control scheme. 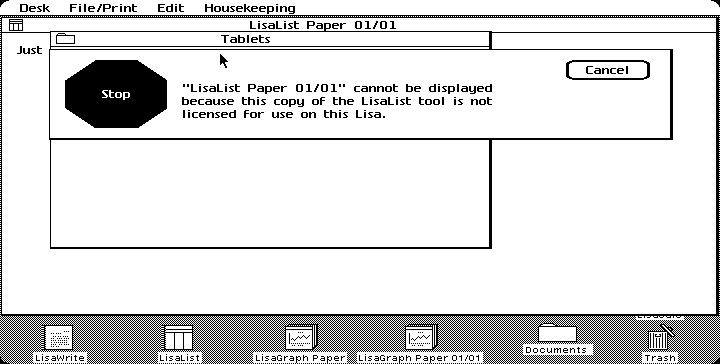 The first time a Lisa runs or in any way "touched" a Lisa office tool the tool would become serialized and from there on out only run on that Lisa. Attempting to run the tool on a different Lisa would result in an error like the one shown above. Apple could do this because they were the only ones who made Lisas and they built a unique serial number ROM in to each Lisa. Most modern PCs have various serial numbers floating around in their hardware, but none of them can reliably identify a machine. Still, Microsoft is having a try at using a copy control scheme kind of like this for Windows XP. The Lisa Office System shutting down. There is no "shut down" option anywhere in the software. 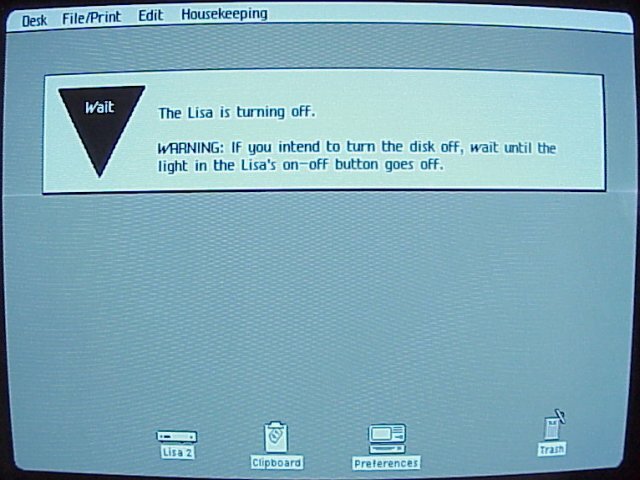 Instead the Lisa computer has a button on the front that when pressed, tells the operating system to close all documents, shut down the operating system, and power down the hardware.